I see this come up more and more, folks asking how much the cost is. Here is the Company ACP that I deal with. They are awesome folks to deal with and the best part five minutes from my house.. Thanks Mr300s. This will come in handy. 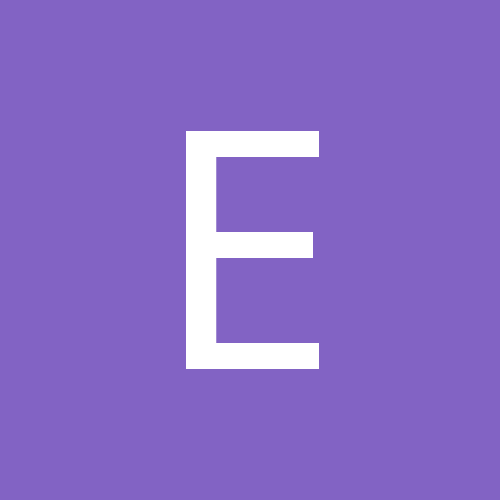 I have a question for you sublimation guys and girls.........I'm getting ready to do put in a bid on a pretty big job at the company I actually work for. They need between 250-300 4"x 18" mini street sign aluminum blanks done up with 5-2D scans on each one along with A-E and a bay number for the warehouse racking. They spent $5000-$6000 on stickers that the forklifts keep rubbing and ruining day after day. I priced out supplies and they are close to $3400.00. Why are your supplies so high if each blank is ball park of $5.00 each that would be $1500.00 for the just the blanks? Then even @ $1.00 per sign ink $300.00 ? ACP Where I buy my stuff has 12" x 24" see prices to give you a ball park idea. (They can also get the size you need) I know that's not the size you need but gives an idea on coast..
Well, I figured in all supplies needed for the entire job. Sublimation paper, ink, sign blanks, hinges, screws, and epoxy. I didn't think about per sign, good idea! They spent $5000-$6000 on stickers that the forklifts keep rubbing and ruining day after day. If forklifts are going to be rubbing against them, then most sublimation products won't stand up to that kind of friction - even sublimated aluminum signs are still just a thin coating of colored polyester on top of aluminum - and it does rub off over time - if anyone has a pet with a sublimated tag and a rabies tag that jangle together, you know that they scratch up. 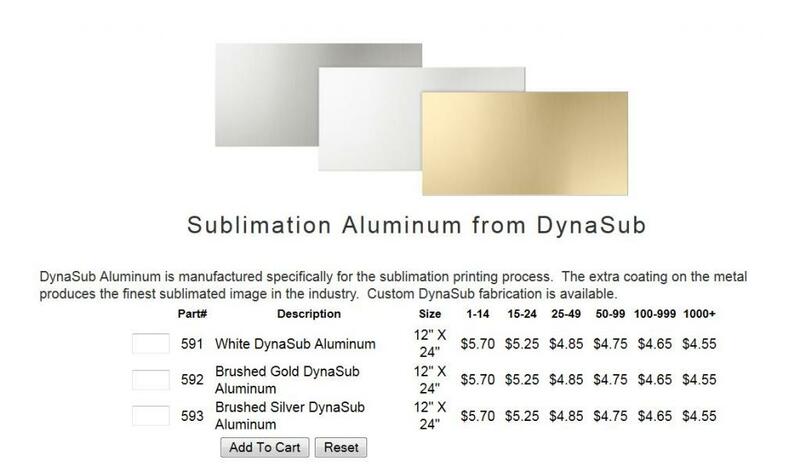 For that type of signage, your best bet is to engrave aluminum or FRP blanks. You might also consider using VHB tape. It's pretty expensive but extremely strong (considered permanent) and much faster than epoxy. Will hold better if it takes a hit too. I used to epoxy my french cleats on outdoor signage until I tried the tape and I'll never go back. You would bend your signs trying to remove it. Would assume that the chart does not take into account the cost of the printer. I'm also curious if this based on using Sawgrass brand inks in an Epson printer or an alternative, like Cobra Ink or one of the other options? 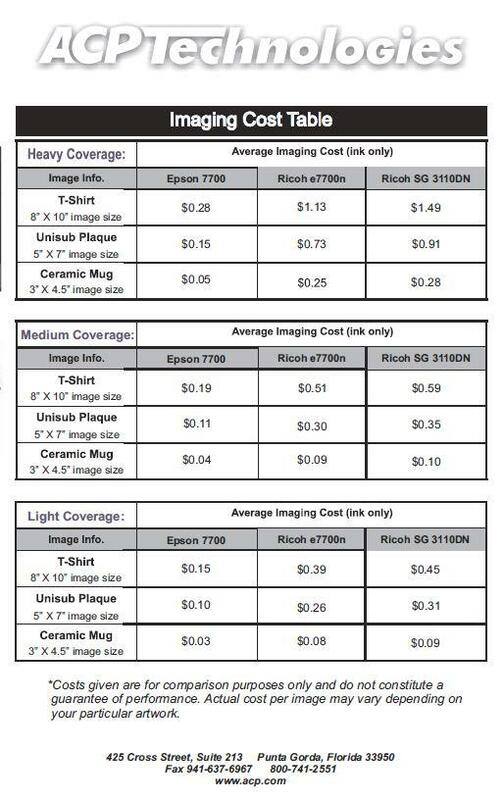 There is quite a difference between Epson and Ricoh costs per page!